Although there is no specific legal standard for addressing hot-work environments, the Occupational Safety and Health Administration (OSHA) is currently focusing its efforts on the prevention of heat-related illnesses. OSHA has launched its annual Campaign to Prevent Heat Illness in Outdoor Workers, and is focusing many of their efforts on ensuring employers are addressing the threat of heat illness. A recent Washington memo to OSHA’s Regional Administrators emphasized the importance of this issue, and stated that “this memo directs the Field to expedite heat-related inspections and to issue Citations . . . as soon as possible.” Employers should take action now to ensure their workplaces are free of heat hazards, or they could potentially face costly citations and litigation. can make it difficult to establish safe working processes. These risk factors include the employee’s physical condition, the temperature and humidity, clothing worn, the pace of work and how strenuous it may be, exposure to sun, and environmental conditions such as air movement. OSHA is urging greater care in adopting an acclimatization program for them. Simply telling your employees that it is a hot day and they should take breaks when they need to and drink as much water as necessary will not meet OSHA’s expectations, and could very easily result in a citation. OSHA believes that employers should actively encourage the consumption of at least 5 to 7 ounces of fluids every 15 to 20 minutes. increase it over 5 days. particular risk are those in outdoor industries, such as agriculture, construction, landscaping, and transportation. who have not built up a tolerance to heat (acclimatization), and it is especially dangerous for new and temporary workers. cases, the employer and staffing agency were cited because they involved temporary workers. 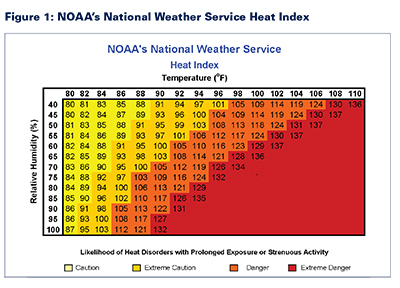 available at: www.osha.gov/SLTC/heatillness/index.html or http://tinyurl.com/3bqo442. for Android-based platforms and the iPhone, the app can be downloaded in English and Spanish by visiting: www.osha.gov/SLTC/heatillness/heat_index/heat_app.html or http://tinyurl.com/mffmqyb.